Description: The Christian faith has always stood in a place of tension between its transcendent nature and the surrounding culture. On the one hand, Christian faith claims to originate in the revelation of God, which transforms culture itself. On the other hand, all such revelation is inevitably received and interpreted by humans in concrete situations. It is no exaggeration to say that two millennia of church history have continually demonstrated the struggle between Christian faith and culture. In an effort to address this struggle, this book explores relevant issues pertinent to the relationship between faith and culture in the particular context of Japan. 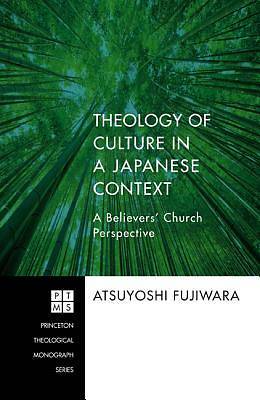 In this unique work, the context of Japan, well known as a desolate swamp for Christian missions, provides the setting for a re-exploration of issues pertaining to theology of culture. As such, Japan provides both a concrete and challenging context to work out a theology of culture. This book also helpfully illuminates for Western readers some key problems that may not have appeared fully in their contexts yet but will do so as the post-Christendom era continues. Endorsements: ""A valuable study of the relation of Christianity and culture, of especial importance to Japanese Christians, but with relevance for all concerned with mission and ministry in post-Christian contexts."" --Alister McGrath Professor of Theology, Ministry and Education, and Head of the Center for Theology, Religion, and Culture, King's College ""Readers of this splendid book will find it to be a masterly guide to the complexities of Japanese responses to Western Christian missionary endeavors in contexts of Japanese nationalism/cosmopolitanism/imperialism and the tragedy of defeat. An acute discussion of Niebuhr, Yoder, and Hauerwas is complemented by analysis of the theologies of Kazoh Kitamori, Yasuo Furuya, and Hideo Ohki . . . to generate a possible theology of culture for Japan and appropriate church structures."" --Ann Loades Professor Emerita of Divinity, University of Durham Honorary Professor of Divinity, University of St. Andrews ""The influence of the theologies of John Howard Yoder and Stanley Hauerwas now spans the globe. Fujiwara has shown, in this significant work, that any thoughtful deliberations regarding Christianity and culture--including a culture as different from the US as Japan--should include a serious consideration of the thought of Yoder and Hauerwas."" --Mark Thiessen Nation Professor of Theology, Eastern Mennonite Seminary ""Fujiwara . . . offers his believer's church theology, based upon his critical study of the theology of H. Richard Niebuhr, John Howard Yoder, and Stanley Hauerwas, to evaluate critically three phases of the history of Christianity in the context of Japanese culture: the rise and development of Roman Catholic mission and church during the feudal 16-17th centuries, the rise and development of the Protestant mission and church from the opening of Japan (1860s) to the beginning of WWII (1945), and postwar Christianity (1945-1985)."" --Robert Lee Author of The Clash of Civilizations: An Intrusive Gospel in Japanese Civilization (1999, 2005) About the Contributor(s): Atsuyoshi Fujiwara is Professor of Theology at Seigakuin University General Research Institute in Japan. He has also taught at Tokyo Christian University, Aoyama Gakuin University, and Keio University.